David Murray's life had not been easy before he enrolled to study at UNE. A workplace accident, severe injury and personal issues had cast him adrift. He engaged rarely with others and refused to leave his Sydney home during daylight hours. "They were very difficult years," said his mother Joan , now 80. But she convinced him to consider pursuing a new direction through study and he eventually found himself studying for a Bachelor of Economics (Econometrics) online at UNE. "The change didn't happen immediately, but after the first residential it was like a transformation," Joan said. "He kept saying that he didn't know why he hadn't studied before. But it wasn't just the study; it was the interest that his lecturers took in him and the good friends he made." 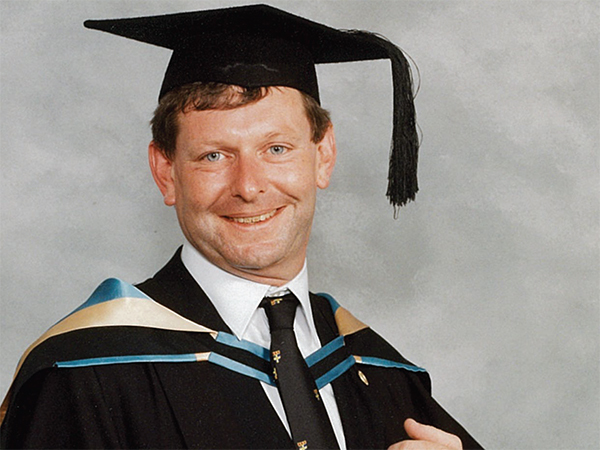 David moved to Armidale to live in college for part of his subsequent Honours year - which he described as "a golden year of happiness" - and had completed his final exams when tragedy struck. He died suddenly at the age of 37, in 2004, due to heart failure. "He may not have had the chance to apply what he had learnt, to go on to complete his Masters and PhD, but all his dreams were there," Joan said. "I was so grateful to UNE for restoring the young man that I knew and restoring his dreams. UNE turned his life around. David found his niche at UNE and it created a whole new world of possibility for him." It's the reason that, as well as a bequest in her will, Joan has budgeted for a small annual award the David Murray Memorial Award for Economics - to reward the highest performing Economics Honours student. "It's my way of honouring David and keeping his memory alive, but also rewarding another student who is trying to realise their dreams," Joan said. David won a few small awards during his study and they were terribly important recognition for him. This award affords another student the pleasure of that positive experience and hopefully inspires them to go on to do their PhD. It says congratulations for all the hard work and be proud of yourself. As for the bequest, she said it is her way of thanking UNE for the major role it played in David's recovery. "I hope it will help to further the education of other students," said Joan, a former primary school teacher and principal, "as well as acknowledge that UNE is a university that cares about the welfare of its students. UNE and Armidale became home for David and that's because UNE made him feel at home. It lit him up and I would like to see other students benefit in the same way." Postscript: Although David sadly did not get to personally receive his First Class Honours in Economics, his then eight-year-old son James accepted it on his father's behalf. James is now enrolled in his first year of a Bachelor of Historical Inquiry and Practice at UNE. Find out more information about leaving a bequest to UNE.